Cyclist Chayanika Gogoi from Assam recently won two gold medals in the 71st Senior, 48th Junior and 34th Sub-Junior National Track Cycling Championships being held in Jaipur, the state capital of Rajasthan. Chayanika, who hails from Dubia-Barigaon near Gohpur in Biswanath district, participated in the Under-16 and Under-18 Girls’ Scratch race and was able to win gold medal in both the events. 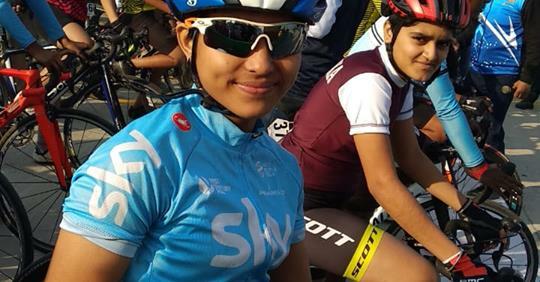 According to media reports, Jayashree Gogoi, another cyclist from Assam, has also won a bronze medal in the Under-18 Girls’ Scratch Race in the championships. According to information, the young cyclist from Assam, has been receiving training under the supervision of Jivan Bora, the secretary of Sonitpur-Biswanath District Cycling Federation. She has already won several gold, silver and bronze medals in national and district level competitions. Chayanika was also selected to represent India in the Asian Cycling Championship held at Jakarta in Indonesia held on January 8, 2019. She was the only Indian cyclist selected for this event. Chayanika Gogoi is the only daughter of Mridul Gogoi, a farmer and Pabitra Dihingiya Gogoi from Borigaon of Dubiya near Gohpur in Biswanath district of Assam. She has been taking training on cycling from Jivan Bora since she was 13 years old. Chayanika has also taken training in New Delhi.